Most people take some form of vitamins, minerals or supplements, rather over the counter, natural or homeopathic. Supplements are taken for many different reasons like energy boosters, for heart health, or promoting healthy skin. However many people are uninformed on the proper supplements to take before, during and after surgery. Here at Criswell and Criswell Plastic Surgery we include healing and recovery supplements for all major elective cosmetic procedures and surgeries. 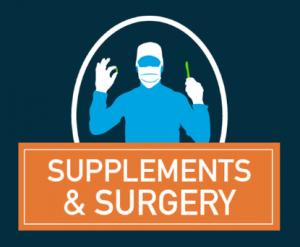 This great infographic from VitaMedica is a great rundown of what to take leading up to, during, and after surgery, as well as what to discontinue. Did you know up to 70% of all patients do not report supplement use during the pre-operative interview? It is important for patients to know that your surgeon must know all medication including vitamins and supplements in order to help your body best recover from surgery. One great homeopathic supplement option is Arnica Montana, known as the Mountain Daisy or Leopard’s Bane. This helps reduce swelling and bruising. Reasons for taking surgical supplements such as Arnica Montana and others like it is to take an active role in the healing process, and so you the patient will look and feel great right after surgery. For more information about these healing and recovery supplements ask your doctor and visit www.vitamedica.com. Criswell and Criswell Plastic Surgery includes surgery supplements for all major elective procedures and also offers healing products for injectable patients. For information about Criswell and Criswell Plastic Surgery visit www.criswellandcriswell.com or call at 704-424-5050.